Jose Mourinho constantly repeated that there was going to be no transfer business at the club in January. After Mark Schwarzer left to join Leicester City, Mourinho said there would be no new signings, he was happy with his squad and no one would be leaving. But, just as it did last season, an offer came in for a second choice player that was too good to turn down. Andre Schurrle left for Wolfsburg for a rumoured £23m, which gave the World Cup winning winger a chance to return to his native land and get more first team football. That money was reinvested in the team, and Juan Cuadrado arrived at the Blues for a fee of just over £23m, with Mohammed Salah going the other way to Fiorentina on loan until the end of the season. 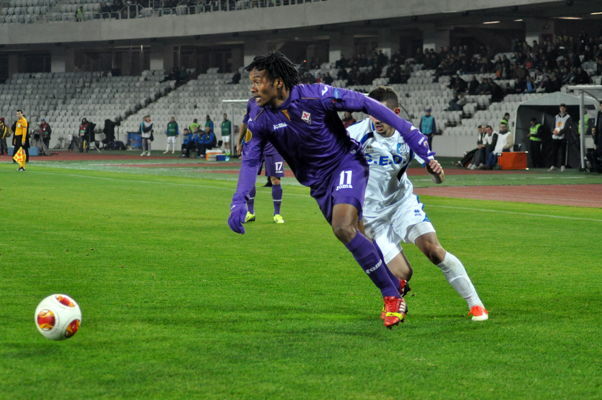 The new signing is sure to lift everyone around the club, but who exactly is Cuadrado? Here is all you need to know about our new number 23. The 26 year-old winger is a Colombian international, and he’s been capped 37 times by his country, scoring five goals. Long before he was a successful footballer, his life was hit with tragedy. When he was just five years old he had to hide under his bed when gunmen burst into his house and killed his father. He grew up in a very rough part of Colombia, and through football he was able to move him and his family out of that situation. If you’ve heard his name before, it’s probably due to the busy summer he had. Our new boy made quite an impression on the World Cup this summer, helping Colombia reach the last 16. He scored once and registered four assists, the joint highest in the tournament. He was heavily linked with both Manchester United and Barcelona in the summer, but neither side met Fiorentina’s asking price. One of the reasons Manchester United were likely after him is because he can play in a variety of positions along the right flank, and he could well have been their wing back on the right hand side. It’s unlikely Chelsea have spent so much on him to put him at right back, but the ability to play there is surely something which Mourinho will rate. He expects his creative wingers to still do a job defensively, and Cuadrado should be able to adapt to that a lot quicker after experience as a defender. As for his style of play, he’s a very pacey player, whilst also being very direct. He’s more of a traditional winger than anyone Chelsea have had in the past few seasons. While at Fiorentina, he was nicknamed the Vespa by Luca Toni because of his ability to weave in and out of traffic on the pitch. During the World Cup he was used as an outlet for a Colombian side that defended very deep, with his pace taking them up the pitch quickly when they got in possession. That should bode well for any tight games were the Blues need to park the bus and play deep. John Square, (his names’ literal translation for those that liked Johnny Kills, aka Juan Mata! ), got his big break when he moved to the Colombian top tier at 20 years old. He played for Medellin for two seasons, before moving to European football with Udinese. He struggled in his first couple of seasons there and didn’t do too well while on loan at Lecce, but another loan move to Fiorentina turned his career around. He joined Fiorentina in 2012 on loan, and helped the club to secure a fourth place finish in Serie A that season. After that, he moved to the club on a permanent deal for €5m. After scoring 11 times in 31 starts last season, he scored four goals in 17 league games this term before securing his transfer to Chelsea. He had been scheduled to face Spurs later this month with Fiorentina in the Europa League last 32, but instead, he now has the chance to face them on March 1st with Chelsea, as he looks to secure the first silverware of his career in the League Cup final. While he has never won a trophy, the Colombian was a runner-up in the Italian Cup last season, and his side were also runners-up in the Colombian top flight in 2008. After his move to Stamford Bridge, he’ll be looking to finally start winning some trophies and we don’t think he’ll have too long to wait. Despite the fact that he played for Fiorentina in the Europa League this season, he is available in the Champions League for his new side. UEFA rules allow clubs to register one player who already featured in the Europa League in their Champions League squads, and the Blues have taken up that opportunity. That means he could get his first taste of Champions League football in the last 16 clash with PSG – not a bad start! As well as being a replacement for Schurrle, Cuadrado could also be seen as a replacement for David Luiz. The Brazilian was seen as the joker of the Chelsea pack until his move to Paris in the summer, but the new signing seems to be of a similar mould. During the summer he and Real Madrid midfielder James Rodriquez were an internet hit as a vine of them hiding in teammate Pablo Armero’s room before scaring him went viral. While he has not yet hit the very top level as a player, Cuadrado does come to the Bridge with an excellent track record. He did well on the world stage in Brazil during the summer, and he sounds like he’s ready to make the step up at Chelsea. Adapting to the Premier League, Champions League and developing the winning mentality that the squad currently has will take time, but the raw talent and application is certainly there. Given his impressive assists record during the summer, he could well add goals to this Chelsea team. His approach is certainly different to that of the main goal creators in the team, Cesc Fabregas and Oscar, and that will be important as the league leaders come up against more and more teams who play with 10 men behind the ball. Given his defensive and attacking attributes, this looks to be yet another impressive piece of business by Mourinho and the club and we can’t wait to see good old John Square in action!